No, I mean the Oh My Ghostess director is the director for Abyss. The writer for Abyss is Moon Soo Yun but I was just wondering about his/her other work. Lol..I misread it...ha ha. Ugly Young-A is the other work this writer did. Not familiar with it though. LOL! That's OK! I've never heard of that either. Let's hope for a good script. I'm soooo hungry, I need someone to feed me some news about this. Been like crazy checking every day for any news articles confirming the male lead . EDIT: Finally, we got the male lead! Finally good news and our lead male, Ahn Hyo Seop, finally confirmed! Can't wait to see him together with Park Bo Young. The writer has also worked on tvN longstanding comedy Rude Miss Young Ae. @raziela I'm so excited as well! I haven't actually watched any dramas of Ahn Hyo Seop but from what I read, I believe he's a good actor, and this might be his big break as well. Yet another tall guy to be paired with PBY, haha...the height difference is gonna be soo cute I'm pretty sure . Okay, so I know Ahn Hyo Seop and Kim Seul Gi had a drama together, and I know Seul Gi's height, well, according to Google is 153 cm. So I guess Bo Young and Hyo Seop will look like this too . Park Bo Young is 158 cm. Idk if that's accurate though. But they will also definitely look like this...ha ha...plus the heel size, so. Oh, I can already imagine Bo Young having to use a stool just like she did in Strong Woman Do Bong Soon . Han So Hee will be playing Cha Min’s (played by Ahn Hyo Seop) fiancée Jang Hee Jin. With her stunning looks, Jang Hee Jin is a mysterious character that vanishes the day of her wedding. Looks like it will be a funny and charming dorama. Judging by the reading of the script, the actors had fun while reading their roles. So, I think, it is worth seeing this drama to get a good mood! Moreover, the actors here are just wonderful. From Park Bo Young & Ahn Hyo Seop you get a good pair! tvN’s upcoming fantasy drama “Abyss” has released new stills of Ahn Hyo Seop. The drama is about two people (played by Park Bo Young and Ahn Hyo Seop) who are revived by a soul-reviving marble called “Abyss.” They find that they’ve returned to life with completely new faces and set out to find their killers. 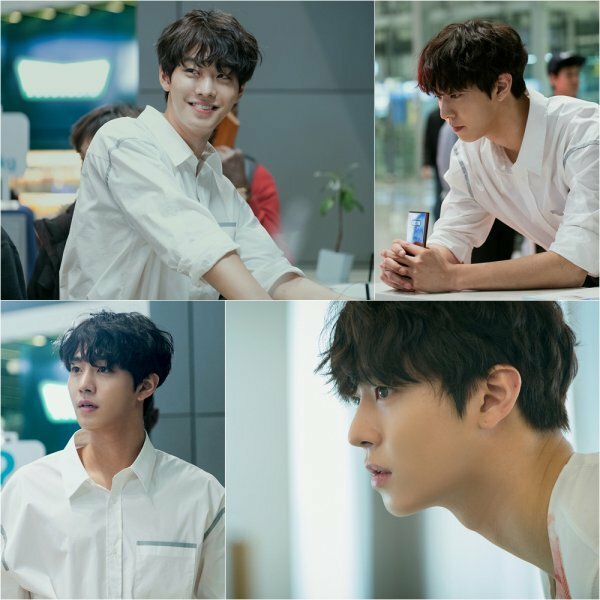 Ahn Hyo Seop’s character Cha Min was a wealthy chaebol who was perfect in every aspect except for an unfortunate face, described as a “visual terror.” After his death, however, he finds that he’s back looking better than ever. Working alongside Go Se Yeon (Park Bo Young), Cha Min pursues the truth behind what happened to him. Thank you for the pictures and articles of shooting and the new poster. The filming pics look great. I love the poster too. Very imaginative and definitely catches your attention. The drama tells the story of two people who are brought back to life by a soul-reviving marble called “Abyss.” They are revived with completely different faces and set out to find their killers. In the poster, Go Se Yeon (played by Park Bo Young) and Cha Min (Played by Ahn Hyo Seop) lie on the road with their new appearances that reflect their souls. Dressed in bright colors that are perfect for spring, the two have completely contrasting expressions on their faces. The chalk outlines around the two characters differ from their current state, as the outline around Ahn Hyo Seop is that of a stout man, and the outline around Park Bo Young is that of a tall, model-like woman. The mysterious marble in Ahn Hyo Seop’s hand is what brought about this bizarre happening. It will be interesting to find out how they got this strange marble in their hands and why they were reborn with new appearances that reflect their souls. Loving the poster! The colors are indeed perfect for a spring drama . Can't wait for May!! !